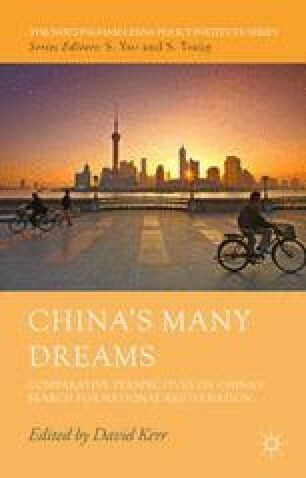 China Dream: A New Chinese Way in International Society? China has always been a very special country in international society. It is an old civilization, but it is also a relative newcomer to the Western-dominated international society of sovereign states. China did not enjoy full recognition and membership in the Family of Nations until 1943 when extraterritorial jurisdiction was finally abrogated through its treaties with the US and Great Britain. Therefore, China’s relationship with international society has always been a big issue in Chinese foreign relations ever since the mid-nineteenth century when China was forced by the West to open its doors.1 The rise of China at the beginning of the twenty-first century is becoming a big story and sometimes a subject of concern in the international society. Thus the relationship between China and the world is one of the key issues of our era.2 Some analysts seem worried that rising China might be a challenger, or even an alternative, to the West in international society.3 In this essay, I am not going to elaborate on every aspect of rising China’s relationship with international society, but focus on two related questions, namely: Is the so-called China Dream advocated by the new Chinese leadership of Xi Jinping a new Chinese Way in international society? Will this new Chinese Way seek to alter the norms or institutions of the still Western-dominated international society?